The angel who told Mary that Jesus would be born. 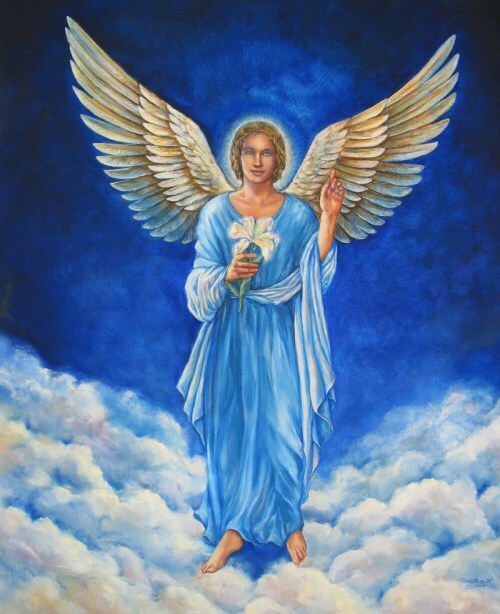 The angel Gabriel is a messenger from God in three major religions: announcer of the savior in Christianity, transmitter of scriptures in Islam, and an interpreter of visions in Judaism. His words to Mary (Luke 1:26-38) are read aloud in many Christian churches on Christmas Eve: “You will conceive in your womb and bear a son, and you will name him Jesus… The child to be born will be holy; he will be called Son of God.” In Islam, Gabriel (or Jibrail) plays an entirely different but equally momentous role: through him, God reveals to Muhammad the words later written down as the Qur’an (Sura 2:97-98). Islam teaches that the prophet then consulted yearly with Gabriel to make sure the words were exactly right. In the Hebrew Bible, Gabriel appears to the title character of the book of Daniel, who has had strange visions featuring a ram and a goat (chapters 8 and 9). Gabriel interprets these as part of a prophecy foretelling persecution but ultimately deliverance of the Jewish people.